Available with Cybrary for Business and Cybrary Insider Pro, this premium application aligns with the NIST Cyber Security Workforce Framework to provide a catalog of hands on labs that quantify a user’s ability around incident response, malware analysis, exploitation, penetration testing and vulnerability assessment, reverse engineering, information assurance and cyber forensics. Categorized by Work-role, the following browser-based labs come pre-loaded with all the software and tools needed. Access real desktops and servers; learn anywhere, anytime, as long as you have an internet connection you can get into any of our labs. Students will leverage Nmap, a network discovery and mapping tool, to identify the systems on a network of responsibility. Students will utilize non-traditional scans to attempt avoiding an Intrusion Detection System (IDS). Students will use the SysInternals Suite of utilities to analyze processes, DLLs, registry edits and other auto start functions to locate and remove malicious software from an infected Windows 7 victim machine. Students will become familiar with the Business Continuity Plan (BCP), Business Impact Assessment (BIA), Disaster Recovery Plan (DRP) and Computer Incident Response Plan (CIRP). Each of these documents are used to address different, but related, aspects of continuing or recovering business functionality during/after an incident. During the course of the lab, students will perform a gap analysis using the provided BCP, BIAs and DRP, and make the necessary fixes to the DRP. Students will use the open source Volatility tool to analyze a memory snapshot and determine what malicious software has infected the victim machine. Students will identify the use of a Buffer Overflow exploit through the use of Wireshark and by analyzing items found in the captured traffic. The students will also find the exploit code and isolate the different aspects of a Buffer Overflow exploit. Students will review network traffic to confirm the presence of malicious activity using various tools including Wireshark and VirusTotal.com. Systems that are required to provide remote or public customer access should be placed in a Demilitarized Zone (DMZ). The DMZ is a separate space set aside for public access but does not allow attackers access to sensitive internal network assets. If public-facing (Internet) servers were hosted on the internal network then an attacker could easily breach the server and use trust relationships or configurations to burrow further into the internal network. Students will use Core Impact to conduct an automated vulnerability scan of specific systems in order to identify potential threat vectors. Students will become familiar with the Business Continuity Plan (BCP), Business Impact Assessment (BIA) and Disaster Recovery Plan (DRP). During the course of the lab, students will perform a gap analysis on the provided BCP, BIAs and DRP, and make the necessary fixes to those documents. After revising the previous documents the students will create a test for the covered assets, procedures and personnel. This lab shows the student how to setup BitLocker on a Windows 8.1 Professional system. In this lab, the student will respond to an incident by blocking incoming traffic on a known port from a specific IP. Students will evaluate policies in place on a domain and apply those policies in accordance to organizational standards. In this final lab we will attempt to exercise all the relevant skills found in this domain. We are focusing on responding to incidents and the skills needed to address these sorts of problems at the “Practitioner” level. Students will confirm the validity of event-data analysis to eliminate false-positive events. This exercise will introduce students to the advanced settings within the Core Impact. Students will modify scan settings to perform different types of scans and to learn about the different functionalities Core Impact provides. Students will then compare the results of a Core Impact scan to the results of a port scan against the same target and discuss the differences and similarities between the two tools. Lastly, students will use the reporting feature to generate Core Impact reports. This lab introduces students to the web application penetration testing suite within the Core Impact application. Students will run Windows Forensic Toolchest against an existing system to create a baseline that will be used for future analysis. Students will create a second baseline using the Window Forensic Toolchest (WFT) and compare it against a previously created baseline using KDiff3. Students will use nmap and OpenVAS / Greenbone Vulnerability Scanner to confirm old vulnerable systems and discover new ones. They will perform a risk analysis of the findings and determine steps to be taken to mitigate the issues discovered. Finally, armed with a previously completed audit report as an example, they will fill out the necessary audit documentation to provide details on their findings and any suggested mitigations. Students will walk through the creation of SIEM reports using the SPLUNK tool. Students will be required to create two documents: a Business Continuity Plan (BCP) and a Disaster Recovery Plan (DRP). Both documents deal with worst case scenarios concerning how to keep business going despite the occurrence of a natural disaster, catastrophic accident or serious man-made incident. Students will have access to the results of a vulnerability scan run again a sample Windows 2008 Server. They will perform any necessary remediations to the server by applying a variety of patches, systems/firewall tweaks in order to further harden it. Next, they will run a follow-up scan to ensure that the previously discovered weaknesses have been mitigated down to a reasonable level of risk. After the verification scan has been completed, they will then author a Standard Operating Procedure to help others walk through the same mitigation process they went through – enabling others to perform the same actions on other Windows 2008 servers. Students use Core Impact to enumerate a local area network and discovery vulnerable machines through a vulnerability scan. Based on the results of the vulnerability scan, students use Core Impact to conduct a penetration test against a previously identified vulnerable machine. Finally, students use the reporting mechanism built into Core Impact to create a host-based assessment outlining the entire vulnerability/penetration test process with a focus on possible remediation actions. In this lab we will simulate the recovery phase where we must perform a backup in a server environment. Students will ingest and process a previously acquired forensic image using Autopsy. The focus of the lab will be on recovering data from the image, reviewing the supplied forensic report and verifying that the image is forensically sound. The student will act as attacker and defender in this scenario. They will receive experience using a custom denial of service python script, and then will switch over to the defensive side. On defense they will need to detect the activity, design firewall rules to block the DoS, implement the rules and then check their effectiveness. In this lab, the student will simulate browsing and downloading a malicious file from a website then learn how to detect the introduction and executions of malicious activity on a Win7 machine. Students will use utilize two virtual machines, inside a protected network, to observe configuration changes on a known good / clean system and all of the unusual network traffic generated by the suspect software they will be analyzing. On the clean system they will use Regshot, Argon Network Switcher, Process Hacker, Process Monitor and Noriben to gather details on what the suspicious program is actually doing. On another support machine they will set up a fake DNS server to receive all suspicious traffic, and pass that traffic over to Wireshark for further analysis. This lab will continue to foster tool familiarization and will provide the students an introduction to capturing network traffic by using a simple “man-in-the-middle” system. In this lab you will perform the steps necessary to set up a pfSense firewall from the basic command line interface and then configure the firewall using the web configuration GUI on a Windows machine. This lab will provide an understanding how network interfaces are configured to allow network connectivity. You will also view and create a firewall rule which enforces your understanding of how network traffic can be managed at different levels â€“ (IP-based, Protocol-based, Machine-based, etc). Students will log into an organization’s firewall, document existing firewall rules, analyze these rules and making recommendations based on this analysis. Students will then make make the necessary changes. This lab takes the trainee into basic concepts regarding establishing baselines of files and directories with Kali Linux and Windows 7. In the first part of the lab, the trainee will establish a baseline of the passwd file within Kali Linux, and in the second part the trainee will establish a baseline of the C:\> drive within Windows 7. Students will identify access to a PFSENSE firewall through the forwarding of SYSLOG (System logs) from a Firewall to the SYSLOG service we have configured and set up on the Network. Students will then identify malicious activity through system logs. Students will detect malicious files and processes using various tools. Students will then remove the malicious files and/or processes. Students will use Olly Debugger to debug a suspect program and determine if any of the observed behavior is malicious or not. They will also use Process Hacker to confirm if a possible DLL injection was successful. 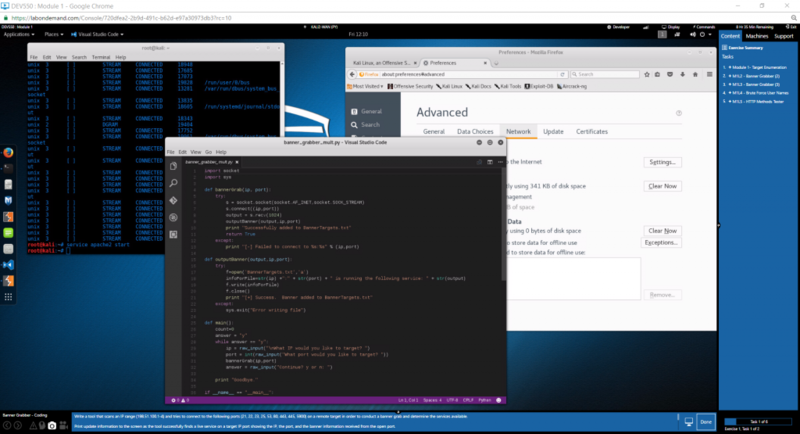 This lab fosters an understanding of debuggers, shows one possible way malicious software hooks into legitimate programs and will provide an “under the hood” perspective on how programs work in the Windows environment. Students will identify known IOCs for Stuxnet and save them for analysis. Students will then identify malicious drivers associated with the malware, and identify AES keys in memory. The highest risk systems are the ones with Internet facing Applications. One an attacker from the Internet is able to compromise the internal network, then it is very likely they will attempt to move to other machines on the network. The machines in the Demilitarized Zone (DMZ) are at high risk because they are not usually as protected as the computers which are part of the Internal Network. This lab exercise is designed to allow the trainee to become familiar with identifying anomalous ARP traffic. This last lab is similar to the Windows Incident Response lab, but different in that this one requires you to run through the IR process in a Linux, more specifically a Red-Hat, environment. The same IR methodologies and procedures apply in both environments; these include identifying any security-issues and their scope, containing the issues as best as possible, removing any present threats if found, recovery, and report-generation. Making sure you account for all of these is the key to sound IR work. When investigating a cybersecurity incident it’s important to take memory snapshots of affected systems for further analysis. Students will conduct analysis and look for malicious network connections, processes, and other artifacts. Network and host based Intrusion Detection Systems (IDS) analyze traffic and provide log and alert data for detected events and activity. Security Onion provides multiple IDS options including Host IDS and Network IDS. In this lab you will setup Security Onion to function as a network based IDS and Snorby, the GUI web interface for Snort. In this lab, you will make changes to the pfSense firewall in order to block specific ports and types of traffic. Least-privilege is an important concept across many domains (e.g., Windows server/workstation management, networking, Linux management, etc.) and requires great discipline to implement properly. This lab walks students through implementing least privilege in both an Active Directory setup and a normal Windows-based workstation. Students will identify if a vulnerability is present in the systems and remediate the vulnerability if necessary. Students will leverage a Zenmap and Microsoft Baseline Security Analyzer (MBSA) in order to perform an internal scan of networked resources. They will, in turn, use the intelligence they gather about these scanned systems to evaluate the security posture of the devices on the network. In this lab students will use command line tools to create, modify, and manage users and groups within the Linux operating environment. Students will use FTK Imager Lite to create a forensic image of a Windows 8 workstation. After they create the image they will perform a hash check to ensure that the image that was created is the same as what is currently running on the live system. Students will use Splunk to ingest server logs and a physical access log to determine if a physical security event has occurred, and if so, who may be behind it. When defending networked digital systems, attention must be paid to the logging mechanisms set in place to detect suspicious behavior. In this lab, students will work with Splunk to help correlate server logs, system logs, and application logs in order to determine if an attacker was successful, and if so what happened and how they got in. Students will correlate server logs, system logs, and application logs to determine what level of access was obtained to the system and what program was used to provide access. Students will use system logs to create a report. Students will be placed in the middle of an encrypted chat session. They will be able to analyze the protocol, find the flaws, formulate an attack, and execute the attack. Students will learn how to conduct manual scanning against systems using command line tools such as Netcat then they will login to a discovered system and enable object access verify that auditing to the object is enabled. This is one of the labs for the Advanced Digital Media Forensics class. Students will analyze a MBSA Baseline report and compare it to current system configurations. Students will then make necessary system changes to machines and validate baseline using MBSA. Students will finally compare hash values to determine if any changes have been made to a system. In this lab we will replicate potentially malicious scans from the Internet against a corporate asset. Scans from the Internet are very common. An analyst should know how to identify this activity by artifacts that are present in the IDS as well as entries in the web logs. This lab exercise is designed to allow the trainee to become familiar with using Network Miner. In this lab we will take the concept of zones and create three zones and route traffic accordingly. We will have the trusted zones ZONE – LAN which will be the internal Local Area Network, ZONE – DMZwhich will be the demilitarized zone, ZONE – WAN – which will be the Wide area network, We will set up a firewall (PFSENSE) to allow internal traffic from the LAN to the WAN. We will allow traffic WAN to DMZ and DMZ to WAN. Internal traffic WILL NOT BE ALLOWED TO ENTER THE DMZ UNLESS IT COMES through the WAN interface. This will prevent/deter hackers who if possibly compromised a DMZ asset will not be able to access the internal LAN segment. We’ll also show trainees how a contractor would likely VPN into a retail network and how to appropriately restrict their access. Students will utilize Zenmap to generate a visual network topology. Open Source Collection	The Open Source Collection lab is designed to familiarize students with the advanced functionality of Google, default webpages used for web-servers, and the specifics of Google Hacking database. This allows the students to understand how open source information can be used for exploitation purposes. Students will participate in attack analysis/incident response, including root cause determination, to identify vulnerabilities exploited, vector/source and methods used (e.g., malware, denial of service). Students will then investigate and correlate system logs to identify missing patches, level of access obtained, unauthorized processes or programs. Students will identify if a vulnerability is present on two Windows systems and then move to remediate the vulnerability, if necessary. Pentesting & Network Exploitation exposes students to all manner of reconnaissance, scanning, enumeration, exploitation and pillaging for 802.3 networks. The Lab topics expose students to a variety of recon, discovery, scanning, enumeration, exploitation, post-exploitation, pillaging, covering your tracks and persistence. Art of Exploitation: Pentesting & Network Exploitation exposes students to all manner of reconnaissance, scanning, enumeration, exploitation and pillaging for 802.3 networks. The Lab topics expose students to a variety of recon, discovery, scanning, enumeration, exploitation, post-exploitation, pillaging, covering your tracks and persistence. Students will use perform incident response on a compromised machine. Students will send a phishing email using the Social Engineering Toolkit. Â Students will then impersonate a user clicking on the attachment to observe how dangerous they can be and generate a phishing awareness email to educate users of the dangers of clicking unknown links. In this lab, as part of the recovery process, the student will restore services to a host in a post-incident environment. Startup services, and firewall settings, will both need to be addressed. Students will utilize Nmap, a network discovery and mapping tool, to identify the systems on a network of responsibility. Using the tool, students will identify other devices on the laboratory network, to include computers and network infrastructure devices, such as routers. Students will take a PCAP indicating the presence of a beacon on the network and analyze it. The analysis will determine if there’s activity that we can mitigate mitigation and then implement a Firewall block with logging to prevent future beaconing. After identifying a SQL Injection attack, students will learn about parameterized queries in back-end web servers to minimize future SQLi attacks. Students will recover a Windows 7 client infected by an unknown payload loaded after exposure to the FlashPack Exploit Kit. The recovery will encompass network traffic analysis to determine infection vector and payload delivery mechanisms as well as system-specific recovery procedures to restore the system to its original functionality. Students will will be introduced to a real world international cyber espionage campaign that has been used to target corporate assets in Taiwan. Students will analyze a packet capture in order to determine the nature of the data being sent between a victim machine and a distant server. Using this information they will have the data needed in order to add valuable content to a cyber incident report. This lab is designed to introduce the student to a Windows rootkit and to some tools and techniques used in discovery and removal of the rootkit. This experience should provide them with a basic understanding of rootkits and the challenges they pose during the removal process. Students will use Zenmap to scan a network segment in order to create an updated network map and detail findings on the systems discovered. They will use the material they generated to help them discover if there have been any changes to the network after they compare it to a previously generated network map/scan. Students will leverage Scalnline, a windows network discovery and mapping tool, to identify the systems on a network of responsibility. Students will utilize non-traditional scans to attempt avoiding an Intrusion Detection System (IDS). Linux environments are ubiquitous in many different sectors, and securing these environments is as important as securing Windows environments. This lab walks you through implementing least-privilege and strong security practices in a Linux environment. Specifically, you will walk through ways to secure your Linux box, look at and fix common areas of privilege issues/abuses, and get introduced to SELinux and how it helps when implementing least-privilege. Students will configure a pfSense Firewall to create/isolate various network segments. You have a known C2 Domain that has infected your network. You will create a DNS record and sinkhole all requests to this domain. This will allow your analysts to identify which machines are in your environment and also protect your network by redirecting systems that attempt to contact this domain. This lab exercise is designed to expose trainees to perform an initial setup for Security Onion and to configure and install Snort and Snorby. This lab will provide the student with experience in manually installing Snort and its support software, as well as with configuring Snort to behave as a Network Intrusion Detection System. Students will create a custom user account and group to run Snort and create/test a custom rule. Often the security analyst will need to update the existing IDS/IPS (Intrusion Detection/Prevention System) to handle new threats. This lab will simulate creating a reject and drop rule for a specific traffic type and alert the Snoby SEIM when they hit. Students will leverage Hping3 to assess ports of various devices on the assigned network. Students will utilize non-traditional scans to attempt avoiding an Intrusion Detection System (IDS). A number of technologies exist that work together to protect systems and networks. The real value of your networks and systems rests in the data that networks carry and reside in systems. In this lab you will focus on some ways you can safeguard the data that resides on systems and when data is sent across the network. Securing an operating system, also known as hardening, strives to reduce vulnerabilities in order to protect a system against threats and attacks. This lab exercise is designed to allow the trainee become familiar with the basic command arguments and usage of TCPDump. Students will conduct scans against a web server, a file share, a printer and a user’s host device. The student will identify specific threats posed to the system. Students will then scan a network and identify potential points of ingress (open ports, etc) that could cause compromise to the system. Students will use organizational firewall for monitoring, detecting and auditing traffic on the network. Students will then configure log traffic of interest forwarded to a syslog server. Students will use pfTop, a network traffic monitoring/statistics plugin used in pfSense, to analyze and monitor network traffic. They will walk through the steps of performing a detailed investigation to determine what type of traffic is occurring across the exercise network. Finally, with the use of use visualization tools they will be able to further analyze network traffic statistics and learn how visuals can quickly aide in the incident response process. Students will be using Power Shell to search for running processes, users and tasks on local and remote systems in the user environment. Students will use OpenVAS to do a vulnerability analysis. Students will then identify applicable vulnerabilities and protect their system(s) against them. Learners will use Nmap and OpenVAS/Greenbone Vulnerability Scanner to confirm old vulnerable systems and to also discover new ones. They will perform a risk analysis of the findings and determine steps to be taken to mitigate the issues discovered. Finally, armed with a previously completed audit report as an example, they will fill out the necessary audit documentation to provide details on their findings and to add any suggested mitigations. Students will setup and configure Core Impact in preparation of a vulnerability scan against an internal network. Students will utilize OpenVAS to identify hosts on a network and assess their vulnerabilities. In this lab you will analyze a capture file of a web application attack in order to identify the attack vector and deduce the vulnerability the attack exploited. Students will become familiar with procedures used in the validation of suspicious files. During the course of the lab the student will generate a system-level baseline using a command line file hash tool, followed by checking new/unknown files against whitelists and online tools. In this lab you will use Windows Event Viewer to view and filter the security event log on a Windows 7 client computer specifically for account logons.